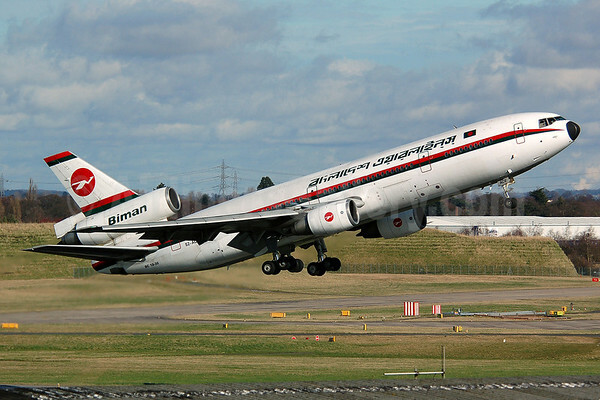 Biman Bangladesh Airlines (Dhaka) as planned, operated the last revenue passenger flight of a McDonnell Douglas DC-10 yesterday (February 24). The last flight was a charter flight (flight 008) from Birmingham with the pictured DC-10-30 S2-ACR (msn 48317) with 200 passengers eager to fly the last flight. The DC-10 type has flown passengers for nearly 43 years and continues today as a freighter with several cargo airlines. Top Copyright Photo: Nik French/AirlinersGallery.com. S2-ACR departs from Birmingham on the the next-to-last charter flight. Bottom Copyright Photos: Allan Huse. A picture of the flight crew and the cockpit for the last flight from Birmingham. The seats in the middle were not sold. 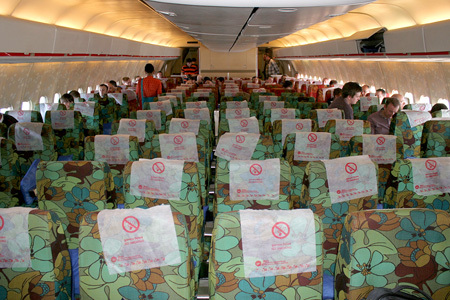 Only the window and exterior aisle seats were sold on the last flight. This entry was posted in Biman Bangladesh Airlines and tagged 48317, BHX, Biman Bangladesh Airlines, Birmingham, DC-10, DC-10-30, Last DC-10 Passenger Flight, McDonnell Douglas, McDonnell Douglas DC-10, McDonnell Douglas DC-10-30, revenue passenger flight, S2-ACR on February 25, 2014 by Bruce Drum.